Red Hot Rao's Has Arrived in Vegas! Charles Rao opened Rao's in 1896 when he bought the property on the corner of East 114th Street and Pleasant Avenue in New York. Since then, the restaurant has become a New York City legend -- an institution, if you will -- known not only for its food, but also for its exclusivity, as it's famously difficult to secure a reservation there. It's no wonder, either, as Rao's has been in the same location and run by four generations of the same family for more than 100 years. Popular consensus therefore ranks it as the country's oldest family-run restaurant in its original location. Now that's staying power. If you haven't yet tried the mouth-watering meatballs from the real Rao's, you've probably purchased the sauce that the restaurant began selling in 1993. If you've cooked that sauce, however, and pretended that you're actually at the 10-table restaurant, then you know it's time you finally sampled the real thing. Don't let its location in East Harlem fool you, either; this is perhaps the hardest reservation to secure on the island of Manhattan. If you don't know one of those who "own" the coveted tables Monday through Friday, you are almost certain to be out of luck. 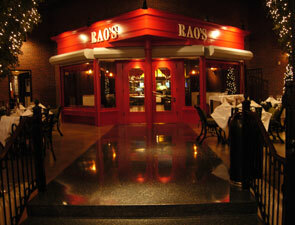 Now, however, your wishes can be granted, as there's a new Rao's in Las Vegas. What's more, it has more than the 10 tables, and one can be yours in exchange for the simple effort of making a reservation. No less hospitable than the original, the new Rao's is certainly larger, as it fits almost 300 seats. 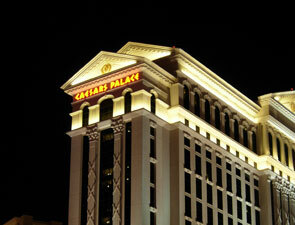 Its spirit, it seems, is also bigger, as the Vegas outpost has a uniquely welcoming atmosphere. In fact, it attempts to create a warm space by dividing the dining area into three rooms, as well as indoor and outdoor spaces. Rounding out the experience are the restaurant's caretakers, Ron, Frank Jr. and Carla, who welcome their guests with open arms. Ron, a descendent of Uncle Vincent -- of lemon chicken fame -- and Frank Jr., whose father is Frank Pellegrino of HBO's "The Sopranos" fame, run the restaurant. Meanwhile, Frank Jr.'s wife, Carla, graces the kitchen, adding her homemade touch to recreated Rao's recipes. So, if you can't get a reservation in East Harlem, hop on a plane and come on out to Caesar's Palace; they'll be so delighted to see you that they'll feed you to your heart's content!